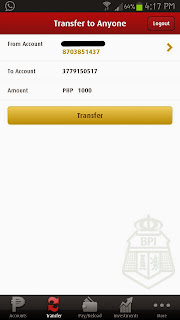 I have been trying to activate BPI Express Mobile's Transfer to Anyone option for two months now (it seemed like forever! ), and I have had several failed attempts before the system finally got it right. 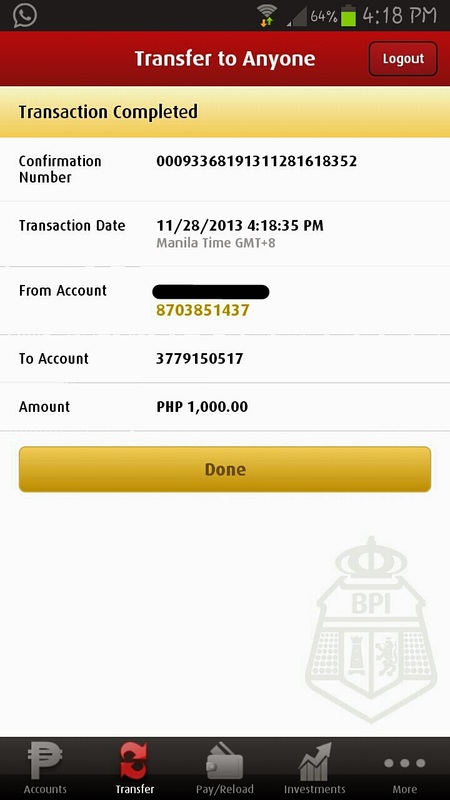 A few days ago, I was able to activate BPI Mobile's Transfer to Anyone successfully. Please note that the experience might differ per mobile phone. I am using an Android phone, particularly the Samsung Galaxy Note 2. 1. 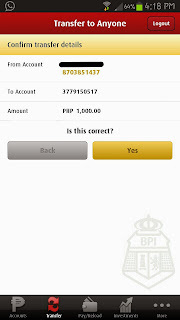 Log in to your account in BPI Express Mobile. 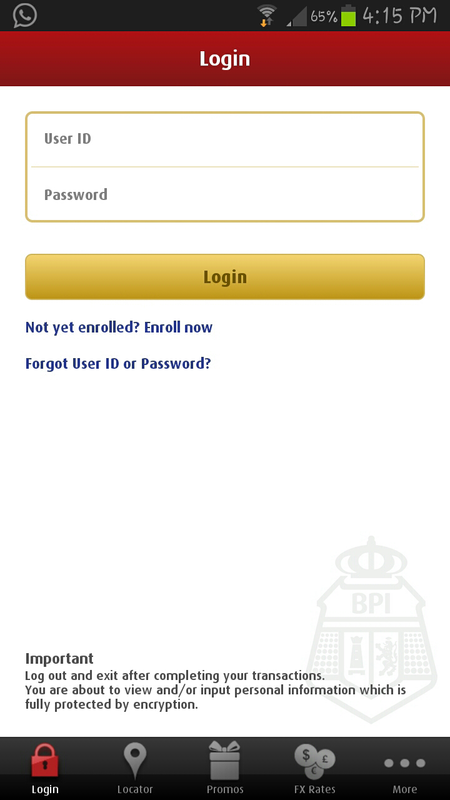 If you do not have the BPI Express Mobile app installed yet, you may request for it at the BPI Expressonline site. 2. Once you have logged in, click more (icon with the 3 circles) in the rightmost option of your bottom menu. Select the Enable Transfer to Anyone option. You must do this through the app. All of my failed attempts for the last two months was when I tried to activate this via the expressonline site. 3. Key in the required details. You will be asked to input the source account and the JAI (Joint Account Indicator) number, which is located in the bottom right portion of your ATM card. 4. 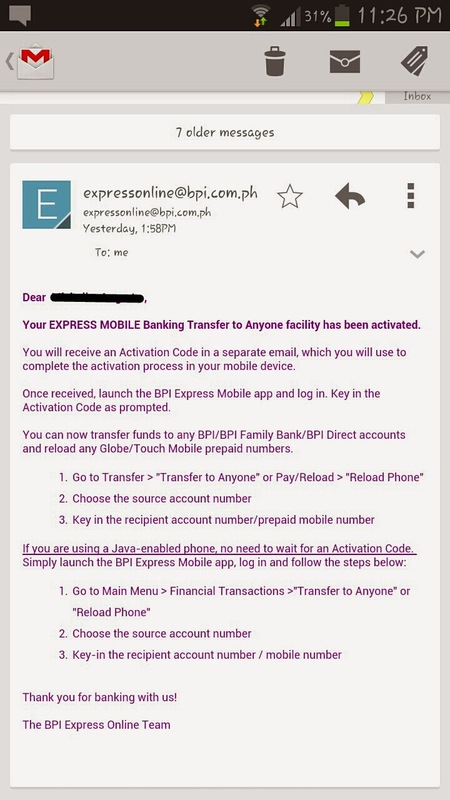 Once you have sent your details, BPI Expressonline will send you an automated message with instructions on how to activate your Enable Transfer to Anyone enrollment via ATM. 5. 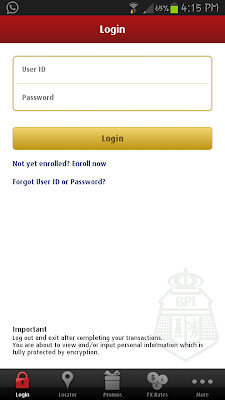 Go to the nearest BPI ATM and activate enrollment as instructed in the email. 6. Once activated via ATM, BPI will send you another email confirming the activation. 7. 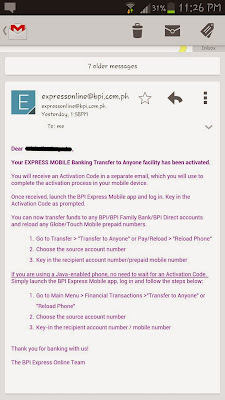 After the confirmation email from BPI Expressonline on the activation has been received, the system is going to send you an activation code to complete the process. Now this is where it gets TRICKY. The system may NOT send you an activation code. I don't know why this happens, but this was when I tried to activate the Transfer to Anyone option via the bpiexpressonline website. Don't bother sending an email to their customer support. 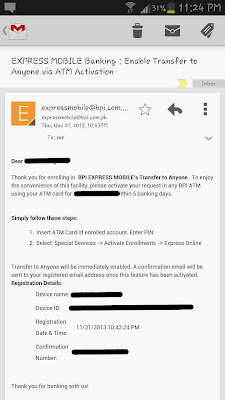 I sent an email out to expressonline@bpi.com.ph and I got a reply more than a week after. Worse, they can't even fix my issue because the activation time has lapsed. 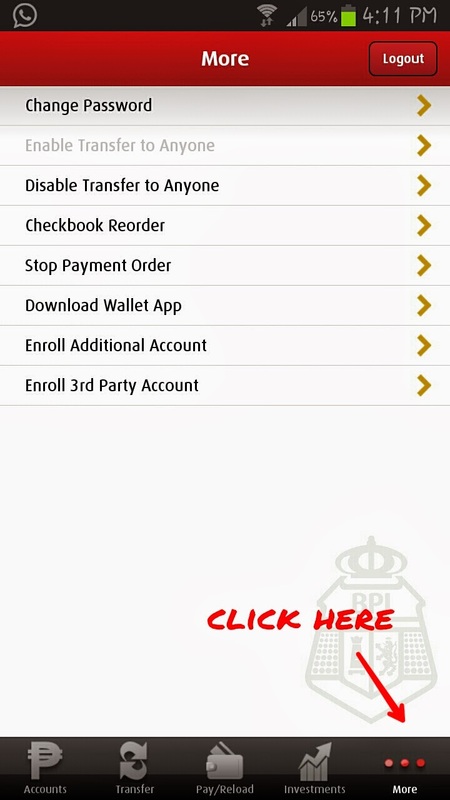 So just try to activate the Transfer to Anyone option via your phone banking app. Else, you will just be wasting time going to the bank activating it (like I did). 8. Once you receive the activation code, repeat steps 1-3 above and key in the activation code once prompted. Ta-da! 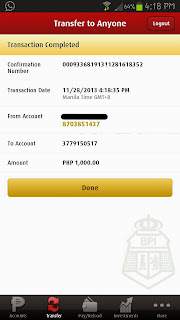 You can now use your Transfer to Anyone option in BPI Express Mobile. Please note that you have to double check the account number you're sending your funds to as the system does not verify anything except send a prompt if you entered the right account number and amount. It does not require you to input an account name. I had to check over and over again to make sure I got the account details right. Next step after confirming the transfer details is sending you a confirmation number of the entire transaction. You can then keep this number or take a screenshot so you can inform the recipient of the transfer. 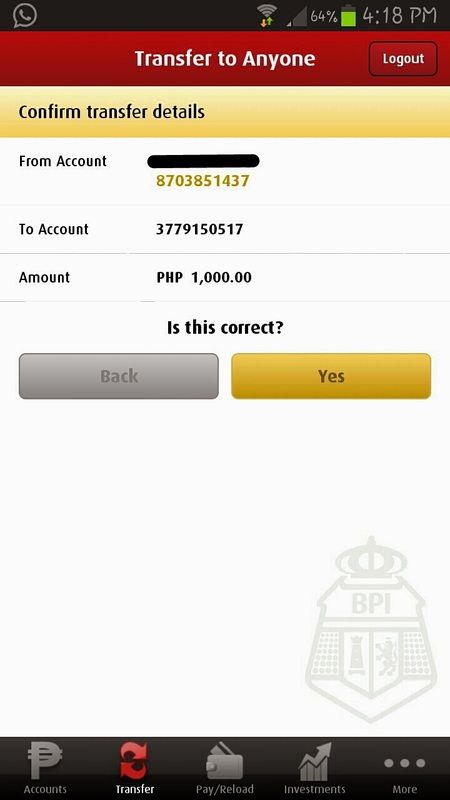 I am happy that I FINALLY got to activate this option in my BPI Express Mobile app. 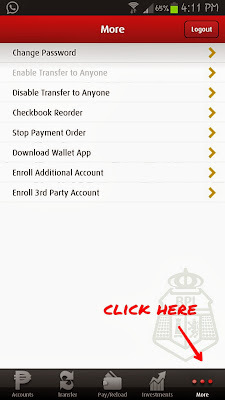 This sure saves me the hassle of physically going to the bank and waiting in line to transfer my funds. Happy mobile banking! Hi en sign. You have to log in first before you can activate. After you log in, access the Transfer to Anyone option from there. Hope this helps! Hi, same thing happened to me and it’s very frustrating since Im outside the country and I cant ask my mother who is not really familiar with ATM ( unless withdrawing their monthly allowance) to activate it. 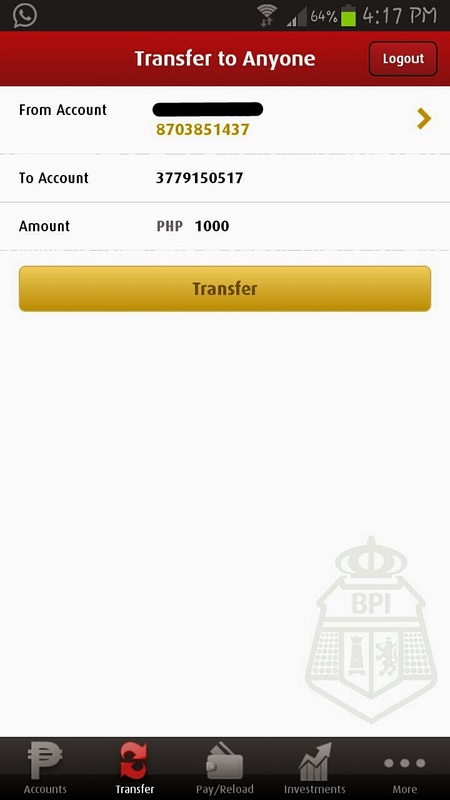 But I got a chance when my sister from Sg went for vacation this week to activate it and thank God I received an email from BPI same as what you received. I am expecting another email since they mentioned it there that they will send a sepraate email for activation code. Good thing I saw your blog and I don’t need to wait in vain for that da*n code. I followed your suggestion to activate it thru my mobile app but I got an error message saying “you have requested activation for another device”. I've been having trouble with this, because I got the first email, but I have been unable to do the ATM activation within 5 days. Now whenever I try to check the special services part through ATM, the Transfer to Anyone feature doesn't show up. : ( Is there a way to just reset and repeat the process? @Candy Sky: When you select Special Services through an ATM, choose Activate Enrollments then Express Online. In my case, I had to repeat the process several times since I did not receive any activation code. It worked only when I requested it via my phone and not online. Good luck! Will I wait 24hours to receive the code in the email after doing the ATM activation?